Beer Pong game is a famous game that originated in the 1950s in colleges in the US during parties. It is one of the most popular drinking games bringing fun to parties, barbecues, birthday celebrations and just any events where people are having fun. The game is played with two players each trying to take off glasses on either side of the table. The first team to take an opponent’s glasses wins. Due to the rise of advanced modern beer pong tables, choosing the best is always a challenge. 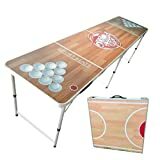 This article will help you with that by selecting some of the best beer pong tables on the market currently. These are some of the best designs that are lightweight, foldable and easy to store or transport. Take a look and choose one. GoPong is the way to go when looking to upgrade your party and give people a fun sports drinking sport. This is a high-strength beer pong table made of the lightweight aluminum to make it portable. It comes with eight balls included getting you started. The size of the table is the official size 8 feet by 2 feet by27.5 inches. It measures a mere 25 pounds allowing people to carry it to parties easily. The table top is durable melamine which is waterproof to withstand beer spills and rowdy parties. Fold it with ease after use for easy transportation and storage. This an 8-foot long beer pong table with great features that make the beer pong game entertaining. The table comes fitted with cup holes and LED glow lights to make play time not only enjoyable but also visible. The LED lights are of 20 different colors with adjustable speed and brightness to add some color to your party. There are actual cup holes on the table to prevent the cups from sliding or spilling alcohol. Liquids are easily deflected by the wax finish which also protects the table. An attached pong ball holder ensures you have your balls near you when playing. The table comes with stunning colors and professional design to look great at any event. This is another durable beer pong table from Pong Party tables with a wax finish that will deflect liquids preventing damage. It folds easily after use in a carrying case with handles and latches. An attached pong ball holders keep the balls close to the players when playing. There are a further six balls included getting you started playing right away. This is an ideal beer pong table when you need to keep the fun going both indoors and outdoors. The table comes with lawn stakes and sand to allow you easily set it up on the beach or that the backyard. It is a standard size table that folds easily for easy storage and transportation. It also comes with six balls and six additional cup holders just in case you want to have a long game. A travel bag for easy carrying is also included. 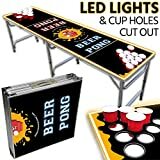 Overall, this is a complete set of everything you need to start playing beer pong right away. The Red Cup Beer Pong table is another versatile choice when you need something lightweight and portable. This table will easily fold into a 2” by 2” carrying case with handles for easy transportation to parties away from home. It has a large 8” by 2” playing surface area and only weighs 22lbs. The table graphics are good making it a bargain with custom balls and a ball rack included. 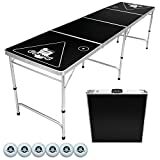 GoPong products are always high-quality, and this premium GoPong table will take your party to just another level. It is a high-strength table yet lightweight. The table is made of aluminum frames that fold flat for easy transport and storage. The pro design of the table makes play very comfortable. Powder coated aluminum frames are strong and will not be affected by beer spills. The table playing surface has been reinforced with the durable and waterproof MDF material to withstand beer spills. 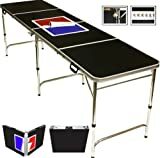 Those looking for quality at low prices should go for this portable beer pong table. It is a perfect choice for college university parties and comes measuring the standard size 8ft by 2ft by 2.33ft when unfolded. However, you can fold the table compact into 2ft by 2ft by 5.5inch which is quite small and portable. LED lights of the table easily help players outline the outside of the table and play fairly. The table comes with cup holes to insert 3, 6 and 10 cup racks. You have nothing to lose buying this table as it is backed by a 30-day money back guarantee if you’re not happy and satisfied. Made of the high-density and high-pressure board, Sports beat is a high-quality beer pong table worth considering. The table frames are aluminum which is not only strong but lightweight. The top of the table is a customized melamine coat which is ideal for dealing with liquid spills. This is a folding table with handles and a convenient choice that you can take anywhere. It is attractive with a fashionable design and will look stunning in any party. The top waterproof surface is quite easy to clean after the party of over. 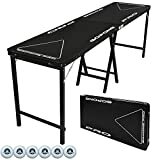 This is an affordable beer pong table that comes with adjustable and foldable legs for ease of setup, storage, and transport. 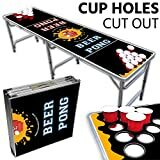 It is another well-priced beer pong table that will make any party lively. The table comes with cup holes cut right at the top of the table with a standard 3, 6 and 10 cup rack games. There is a further additional spot for your water cup. This is a suitable pick for indoor and outdoor parties. It comes with a 30-day money back guarantee in case you’re not happy with the product for whatsoever reasons. 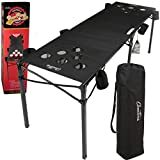 The Cameron Portable Beer Pong table comes with a collapsible regulation size making it an ideal choice for outdoor parties. The table collapses flat for easy storage and transportation. It comes with six beer pong balls and six additional cup holders to hold the drinks of the spectators. Lawn stakes and sand further allow for easy setup at the beach, backyard or anywhere outdoors. Make any party lively by getting a beer pong table today. Beer ping tables remain one of the best ways to have great fun while drinking. We’ve reviewed the best beer pong tables on the market for you to buy. Go right ahead and order with confidence as these are the best on the market currently.